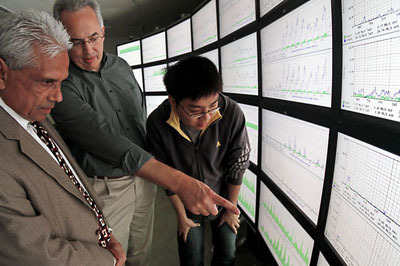 Computer engineer Brad Smith (center) directs the Network Management and Operations Lab at UCSC. Photo by Jim MacKenzie. The Baskin School of Engineering at UC Santa Cruz is offering a new major in network and digital technology. Leading to a B.A. degree, the new program provides students with in-depth knowledge of networks and computer technology, while giving them the flexibility to specialize or combine the major with other interests. The Department of Computer Engineering will administer the new program, and students can start enrolling in fall 2011. The requirements for the B.A. in network and digital technology are less intensive than those for the department's B.S. degrees in computer engineering and robotics engineering. The flexible requirements for the degree will allow students to specialize, through the elective courses they choose, in a specific area associated with computer engineering. They can also combine the major with a second major or a minor in a field outside the engineering school. "This degree is intended for students who have an interest in the technology but don't aspire to be engineers," said J. J. Garcia-Luna-Aceves, Baskin Professor and chair of computer engineering. "They won't be building computer systems, but they will understand systems and networks and will be prepared to work in teams with engineers." Job opportunities in computer networks and digital technology are likely to grow, he said. "Network systems and data communications analyst" is one of the fastest-growing occupations, according to projections in the 2010-11 Occupational Outlook Handbook from the U.S. Bureau of Labor Statistics. Graduates of the new program in network and digital technology will be well prepared for many of those jobs, said Martine Schlag, professor of computer engineering and undergraduate program director for the department. "Not everybody needs to be an engineer to work in this field," Schlag said. "A person with an understanding of computer systems and networks who also has a background in economics, for example, would be very valuable." Graduates of the program will be prepared to contribute to engineering design teams, work on technology development, do technical marketing or sales, or join the computer networking workforce. "A lot of employers will value people with a background in network technology," said Katia Obraczka, professor of computer engineering. "Everything is being networked, and there will be increasing demand for people who have a deep understanding of this technology." More information about UCSC's computer engineering undergraduate programs is available online at www.ce.ucsc.edu.